On May 21, 2017, Bethlehem-born Christian academic and author Mazin Qumsiyeh, former professor at Yale and Duke universities, posted an article claiming that US president Donald Trump’s coming one hour visit to Bethlehem, in Jewish occupied West Bank is an insult to the Christian world. “Trump will do a token visit to Bethlehem Tuesday and desecrate the city of the Prince of Peace with his entourage of racist Zionists. I wish I was there to join demonstrations against this symbol of hypocrisy (I’, still in Europe),” wrote Dr. Qumsiyeh. “Everyone now knows that the US government, Israel, and the Saudi regime have been the biggest perpetrators of terrorism and genocide in the world. This is to serve one interest and one interest only: money. Just to emphasize this, the US arms industry (owned largely by Zionists) will get 110 billion deal (bribe) from the Saudis. Kushner is very happy as are all the rich profiteers around Donald Trump,” added Dr. Qumsiyeh. 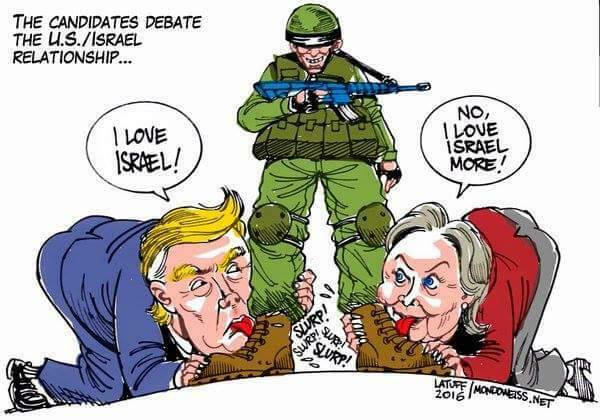 “Trump’s mission to wage war on Iran for Israel will not work any better than Bush’s war on Iraq for Israel. Times are changing though the imperialist mentality still persists,” said Qumsiyeh. Trump’s visit to Al-Quds (old Jerusalem) has already cost a Palestinian life at the hands of trigger-happy Jewish police on Monday. The victim, as usual Israeli lie, tried to stab a Jew police officer with a knife who was protecting Donald Trump from the Jew-hating Palestinians protesting in solidarity with hundreds of hunger striking prisoners held in Israeli jails. It’s not only the Palestinians who are protesting against Donald Trump’s visit to the West Bank. Earlier a number of Netanyahu’s cabinet ministers refused to meet the US president as result of his meeting with West Bank president Mahmoud Abbas at the White House and his sale of US$110 billion worth arms to Saudi Arabia. In Tel Aviv, the American idiot told the pathological liar host Netanyahu that Iran will never have nuclear weapons. And the idiot think that Netanyahu, who had been crying wolf about Iran’s nuclear weapons within a year or two since the 1990s will take his word. The American idiot, who earlier threatened to tear-up the nuclear agreement between Iran and the six non-Muslim world power – chickened out during his visit to the Wailing Wall. Trump lauded his predecessor Barack Obama for signing a fantastic deal with Iran. “But instead of saying thank you, Iran continues terrorism in the region by supporting groups and regimes which want to destabilize America’s friends in the region,” said Trump. He was referring to Iran’s support for Hizbullah, Hamas, Syrian president Assad, and Yemen’s Houthi resistance. Trump also told an embarrassed Netanyahu, I never mentioned Israel in meeting with Russians – inadvertently confirming that Israel was the source of the intelligence disclosure. On May 16, 2017, Adam Goldman at the Jew York Times had admitted that the intelligence information Donald Trump shared with Russian officials in the White House was provided by the Zionist regime. Gaza-ruling Hamas has slammed Donald Trump for calling the Islamic resistance a ‘terrorist organization’ which poses a threat to world peace during his speech in Riyadh. I’m sure the American idiot doesn’t know Hamas has no tank or F16s or nuclear bombs like the Jewish army to terrorize regimes in the region and Europe. Bethlehem is home to the Christendom’s holiest place Church of the Holy Sepulchre where Christians believe Jesus was buried after resurrection. But most historian believe prophet Jesus was born in Nazareth because he was called Nazorean. But the organized Jewry and Christian Zionist insist Jesus was born in Bethlehem: the city of King David who according to an idiot pastor Jamie Greening, was a womanizer (sic).